The U.S. Department of Commerce said Wednesday it would impose final antidumping and countervailing tariffs on Chinese common aluminum sheet products of 96.3 percent to 176.2 percent. It’s the first time that final duties were issued in a trade remedy case initiated by the U.S. government since 1985, according to Reuters. The final aluminum sheet duties, however, were reduced from those first imposed in April and July. The initial combined range was 198.4 percent to 280.46 percent. The National Marine Manufacturers Association estimates that prices of aluminum sheet, even domestically produced products, have increased between 30 and 40 percent. A coalition of businesses that oppose tariffs, called Tariffs Hurt the Heartland, say companies paid 50 percent more in tariffs in September than the same month a year ago, according to CNBC. 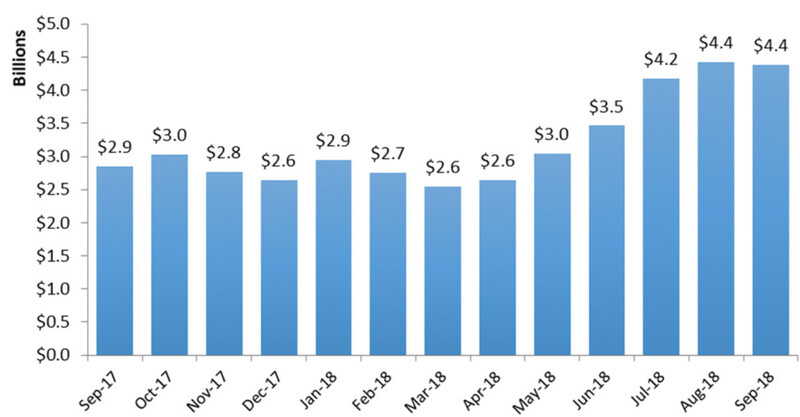 The businesses paid $4.4 billion in tariffs in September this year, with the increase driven primarily by $1.4 billion in tariffs on Chinese imports and foreign steel and aluminum, according to the group. The export tariff data released Thursday shows that retaliatory tariffs had an immediate and severe impact on US exports. In September, US exports of products subject to retaliatory tariffs declined by $2.5 billion, or 26 percent, from the previous year. The coalition unveiled an interactive tariff tracker map that links articles that highlight situations in which tariffs hurt companies, farmers and consumers around the country. In 2017, 44 percent of all new boats sold, or 111,0000, were aluminum based, accounting for $3 billion in economic value, according to the NMMA. Domestic aluminum boat production and sales account for nearly 22,000 marine industry jobs. The NMMA and members have testified before the International Trade Commission, which is scheduled to make a final decision in the case on or before Dec. 20, to ask the administration to remove all the tariffs.